While our maple leaves are turning crimson & gold, temperatures are falling from crisp to cold. Record lows are forecast for the next few nights. At Dog Bark Park today’s high was only 36. With winter coats & bright sunny skies the day was pleasant though for tending to outside Fall chores. 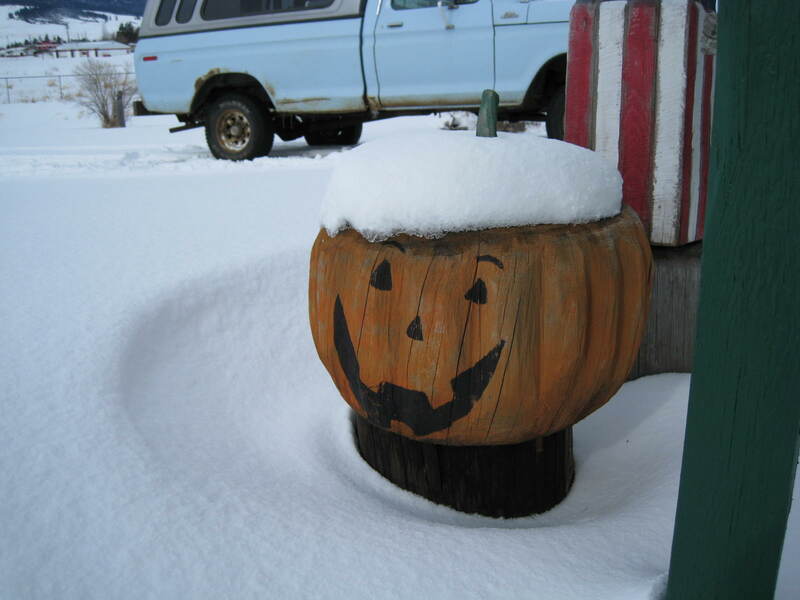 Here’s hoping our Halloween jack o’lantern won’t be seeing any snows like this for awhile. Grinning no matter what the weather! 1. Pick small branches when leaves are in their fall prime & right away place stems into water. 2. Boil one part liquid glycerin (available from pharmacies) and two parts water for about 10 minutes. Remove from heat & let the solution cool. 3. Remove branches from water and pick off curled or damaged leaves. 4. Mash the stems with a hammer. This will increase absorption of the glycerine solution. Or, use a sharp knife to cut length-wise slits in the stems. 5. Stand stems in the solution and place container in a dark, cool place for a few weeks for the solution to be absorbed. In a couple of weeks you should be able to feel it on the leaves. Remove branches from the solution & wipe leaves with a soft cotton cloth. Place in pretty containers or scatter across a table top or mantle. Note: colors may deepen somewhat over time. Enjoy the leaves for several seasons. We’ll be issuing a very long overdue e-newsletter in a couple of weeks. If you’d like to receive a copy click here, or subscribe by visiting our home page, lower left column. Thanks. Just glanced through your post. failed to have the time to browse the whole thing. I subscribed to your rss feeds and trying forward to more. Thanks so much for being in touch. sorry for delay in responding; just too much going on. Have a great doggy new year!